AMBUNDANCE OF TIGERS AND THEIR DEVASTATIONS. SINGAPORE STRAITS SETTLEMENTS, Saturday, Nov. 24, 1877.—The voyage hither from Bangkok is an affair of four or five days, and not a very cool one. The service is performed by two steamers that endeavor to run alternately, though they are quite independent of each other, and in some matters are in opposition. One, the Bang-Yong-Sing, is owned by a Chinese merchant in Singapore, and has an English Captain; the other, the Bangkok, is owned by Siamese and has a German Captain. The steamers are nearly alike as to size and carrying capacity, and each is under 400 tons measurement. The fare is $60, and half the passage money goes to the Captain, who supplies food and drink in return, and is induced to treat passengers very politely, in order to secure their future patronage and friendship. We were six in the cabin of the Bangkok on the downward voyage, and certainly there was nothing to complain of except the temperature. It was hot and hot and hot; there was hardly a breath of air, and the only breeze we had, with a very few exceptions, was what the steamer created. We spent all our time on deck, except at meals or when driven to cover by the rain. It was very nice to sleep on deck, but our pleasure was twice marred by showers, once at 3 A. M., and once about 4 A. M. To be roused from comfortable dreams of home to seize our pillows and hurry below was not at all pleasing, and we were thankful that Pluvius did not venture often upon the joke. An awning covers the after-deck of nearly all steamers in the East, and keeps away the rays of the sun, but it is rarely sufficient to resist the heavy downpour of a tropical shower. Somehow, the north-east monsoon, which was blowing finely between Shanghai and Hong Kong a month ago, has not yet made its appearance on the coast of Malacca, though it is considerably overdue. The elements seem to be more or less out of their reckoning all over the Orient. Bangkok is in latitude 13° north, and ought to be cooler than Singapore, which is only 1° 20' north. When Bangkok was so warm as to threaten to convert me into a funeral baked meat, I shuddered to think of the salamandering I should get in Singapore, and the thought occurred to me to buy a diving-suit of rubber cloth and fill the space between it and my skin with ice-water. But Singapore has been an agreeable disappointment in the matter of heat; the nights are about the same as in Siam [Thailand], and during the daytime a pleasant sea breeze tempers the heat very considerably. Where I perspired barrels in Bangkok, I only perspire gallons here, and locomotion in the middle of the day is not at all disagreeable. There was no ice in Bangkok, and we were allowed to take all our cold drinks hot, but they have ice here in reasonable abundance, when their machine is in working order. It was plenty yesterday, and I luxuriated in iced lemonade every hour or two. To-day the machine is broken, and the resemblence to Bangkok is more apparent. It is to be fervently hoped that the damage is only trifling. And, speaking of ice, reminds me that the Tudor Company, of Boston, has of late years been running quite a competition with ice machines in several of the Eastern ports. Hong Kong and Batavia [Jakarta], among them, have witnessed some interesting reductions in the price of ice, the final result being a compromise at figures renumerative to all parties. The Tudor Company endeavored to run out the machine ice, and the machinists endeavored to run out the Tudor Company. At Hong Kong, for example, the Tudors reduced their figures below the cost of machine ice; the machine men stopped work, and the Tudors smiled. Soon they advanced their prices, and next day, to their dismay, the machine men started again. This was done several times, the machine stopping when it could not sell at a profit, and starting again when the figures advanced. A compromise was proposed and made, and now both parties are doing well. The same has been the case in Batavia and other places where ice machines on a large scale have been introduced, and the two parties brought into active competition. The foreign population of Singapore is not large enough to make an extensive demand, and consequently there is not an active competition. There were two ice machines here at one time, but one of the machines became bankrupt, and its machinery was sold out and taken to Saigon [Ho Chi Minh City]. At present ice is sold at 4 cents a pound whenever the machine is not broken down, and I am told that this occurs pretty often. There is a good "pigeon," to use the Eastern expression, for any man who can invent and make a cheap, effective, simple, easy-working ice machine on a small scale. It should retail at $25 to $40, and should be simple in construction, so that the coolies and house-servants can work it... The best small machine at present is the Carré, a French affair, but it is quite expensive ($50 to $80 according to size,) cumbrous and heavy, and liable to get out of order. It operates by the evaporation of ammonia over a charcoal fire, and the smallest size makes two and a half pounds of ice in three hours. Where is the large-brained American who will outdo it? Don't all speak at once. Landing in Singapore is not one of the pleasures of life, as it includes a lively wrangle with Malay boatmen. The boatmen form a syndicate for the maintenance of high prices; they demanded $3 to transport two of us and our luggage to land, and it requried an hour's bargaining to reduce them to $1.25. The contract included carrying our luggage from the quay to the hotel; and, as the house we designated was full, we were forced to go to another, and this circumstance was the pretext for an increase to $3 again. We only got off with $1.50 by threatening to turn the fellows over to the Police and using some energetic language expressive of our wounded feelings. If some other American will invent a cheap, portable, and self-acting boatman and cab-driver, with boat and cab attached, which can be carried in the pocket or satchel, and be always ready, he will be a blessing to traveling humanity, and, what is more, will make a fortune. Put me down for two or three dozen for myself and friends. Boats and carriages in strange places are the betes noirs of the traveler's existence, and rob him of several per cent. of his pleasure. From Shanghai to Marseilles the boatmen are the same rapacious, clamorous scoundrels, ever ready to plunder by fair means or foul. Chinese, Malay, Bengalee, Arab, and Maltese, they are all alike; their nationalities may change, but their characteristics never. Singapore is an English port, like Hong Kong, and like Hong Kong again, it has a large population of Chinese. I am told that there are some 70,000 or 80,000 Chinese living here, and the number is increasing year by year. They are found in all occupations, from lowest to highest; they are hewers of wood and drawers of water (literally,) and they have shops, stores, and the like by themselves. Some of them are merchants of a high class, and conduct an extensive business, which includes the ownership and management of steam-ships. The hotel has partly Chinese and partly Malay servants, and the attendants in the large retail stores have a majority of Chinese, who speak English with fluency and precision. The most of the Chinese that I have met speak pure, rather than pigeon, English. I remember at Hong Kong meeting a Chinese, the agent of the Bangkok steamer, whose English was perfect, and when I mentioned the matter to a resident friend he exclaimed: "That man is a Singapore Chinaman; they all speak good English at Singapore and Penang." The hotel is infested with Chinese peddlers, who bring you shoes, caps, Chinese and Japanese goods, besides a variety of small wares from London and Paris. They do not deal on the one-price system; I paid 60 cents last night for an article for which $2 was originally demanded, and learned afterward that 50 cents would have secured it, beyond a doubt. There are many Bengalee and other natives of India here, and there is a considerable population of pure Malays. Taken together, Singapore is a picturesque spot, so far as its people are concerned. You meet Indians, with turbans and bright-colored sarongs and with flashing eyes, that seem to dart with flames of hate and spite at your Occidental face. You meet Parsees [Parsis] with high-crowned and rimless hats planted on the backs of their heads, and with garments more than half European in their style and cut. Then you pass a group of Chinese workmen stripped to the waist, and wearing naught on their heads beyond the classic cue; near them is a group of Malay workmen, bare as to body and lower limbs, their entire garments consisting of a loin cloth and a huge turban. Sometimes the turban seems larger than the man, as it is a mass wound from several yards of muslin, while his body is slender and without an ounce of superfluous flesh. These Malays have splendid forms... I have seen them in London and Marseilles, New-York and San Francisco, and there is hardly a seaport on the globe which has not been visited by Malay sailors... the general rule of ships is to take twice as many Malays as she would of European seamen. But their wages are low, and they endure the heat of the tropics much better than would their pale-faced competitors. No one I have asked appears to know the foreign population of Singapore, but exclusive of the garrison I have not heard it place above 1,000, nor lower than 500. It is made up of English, Germans, French, Portuguese, Dutch and Italians, the English being the most numerous, and the other nationalities following in about the order I have named. All are clustered around what is called the Square, and in a walk of 10 minutes you may pass in front of all the foreign banks, hongs, Consulates, and other places of business in Singapore. Like their fellow-merchants of Hong Kong and Shanghai, they employ many Chinese, and comparatively little business is conducted without the aid of a compradore [comprador]. I had occasion to present a check at a bank to obtain the material necessary for hotel bills and steam-ship fares. It was taken by a Chinese paying teller, who referred it to a Chinese book-keeper at a little desk behind the counter. The latter made an entry in a book, stamped the check and returned it to the teller, who at once counted out the cash and sent me on my way. Not an Englishman or other European was in sight behind the counter, and all the piles of silver and bank-notes were in the control of half a dozen Celestials. The same is the case in many other business houses, so that the mercantile firms of Singapore do not represent a large number of Europeans in their equipage of chief clerks and other employes. The Chinese seem to be crowding out the Europeans quite as rapidly here as in other places, and there is not a branch of any kind of business with which they are not thoroughly familiar. They might send every European away some pleasant morning, take Singapore into their own hands and run it quite as well as it is run now. The Singapore Post Office has a European chief, but all the employes are native. There is much complaint about its management, and it is alleged that letters frequently disappear for the sake of the stamps upon them. I was told so in Bangkok, and hear the story repeated since my arrival. A gentleman advised me to register any valuable letters—and what letter is otherwise? Accordingly, I put in one cover several letters I wrote on the way from Bangkok and registered the package to a friend in New-York. I trust the parcel goes through safely, or THE TIMES and I will suffer. Postage to America via England is 12 cents the half ounce, and registration is 8 cents; for letters via Hong Kong to San Francisco they charge the modest figure of 24 cents the half ounce. Somehow, England has managed to keep her Eastern colonies out of the Postal Union, and the rate are anything but light. She has a contract with the Messageries Maritimes Company, which run alternately with the English steamers, and give a weekly service each way from Europe to China and Japan. The service is prompt, and the steamers arrive and depart almost with the regularity of railway trains. Do not understand me to imply that the bad management of the Singapore Post Office is typical of the general postal management in the East. The Hong Kong office was warmly commended for its exactness and security by the very persons that denounced the one at Singapore, and I heard no complaints about the offices at Shanghai or any other place I have visited. At Bangkok the foreign Post Office is at the British Consulate, and letters for England and America are placed in the Consular bag and sent, without any way-opening, to London. There is no postal system in Siam as yet, but the Government talks of having one before long. Singapore has quite an extensive business, as will naturally be inferred by any one who considers its geographical position. It is a purchasing point for Siam and Borneo, and, in a great measure, too, for Java, Sumatra, and the great and little islands beyond and around. Its dealings are almost entirely European, and I cannot learn of an American house in business here, and only two or three Americans. I am the fortunate recipient of a remittance in the shape of a £100 draft on the Barings, of London, by a well-known New-York house, (James G. King's Sons.) The representative here of the Barings shakes his head, and says he never heard of the drawers; the other bankers do likewise, and I am now on a search to prove that such a firm really exists, and that I am not a fugitive and a vagabond. Unless I succeed, I shall be forced to ask the nearest way to an asylum for the destitute. Fortunately the weather is warm; one needs little clothing, and no fire; sleeping in the park is by no means uncomfortable, and boiled rice is cheap, though a trifle monotonous after a week or two. Evidently the business relations between New-York and Singapore must be very light when not a single banker has heard the name of house that has been long engaged in banking and dealing in foreign exchange, and has descended from father to sons. at GMT+8 with no DST. 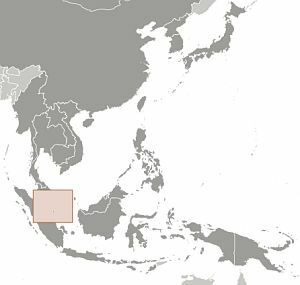 The Republic of Singapore is located at the southern tip of the Malay Peninsula. 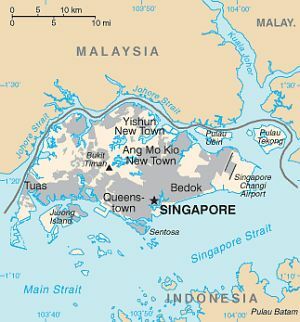 The nation consists of the main island of Singapore, plus about 60 small islets. The combined area of Singapore is about 240 square miles (622 square km). The islets contribute about 18 square miles to the total area. The capital is the city of Singapore. The estimated population of Singapore in 2004 was 3,499,500. The official languages are Chinese, English, Malay, and Tamil. Chinese is spoken in most households; English is used for politics and business. About 75% of the population is Chinese, with Malay and Indians making up the bulk of the remainder. Singapore was made a British colony in 1819, before which it was only a few fishing towns and a small trading port. The British made Singapore a major international trade center, and imported workers from China and India. Singapore joined the Federation of Malaysia when it was formed in 1963, but separated to become an independent state on Aug. 9, 1965. Singapore subsequently became one of the world's most prosperous countries with strong international trading links (its port is one of the world's busiest in terms of tonnage handled) and with per capita GDP equal to that of the leading nations of Western Europe. Petroleum comes here in fair quantities, and there is a fair trade in weighing apparatus, and a few other things of Yankee make. I was talking this morning with an English merchant, who assured me that nothing American was sold in Singapore except petroleum. I ventured to say that I had just seen an American scale in front of a warehouse. "American, American," he said; "what is the maker's name?" I gave it, and he replied: "You are mistaken; that is an English house. Perhaps they may have a branch in America, but they are certainly English." Thus do our American manufacturers have nationalities thrust upon them without the formality of a consultation. I have been told recently that Gen. Grant was of English birth and emigrated to America at the age of 18! The lions of Singapore (which means "City of Lions") are not numerous. There are two gardens, one belonging to the corporation and one belonging to a Chinese merchant, both of them well worth a visit. The luxuriance of tropical growth is well illustrated, and one sees new and curious trees that would require much space for a description. Each garden has an orang outang [orangutan], one of them the largest I have ever seen, and so human in appearance that my heart warmed toward him, though I kept it carefully out of his reach. There are pretty drives around and over the island, and one may now and then meet a tiger in the portion of the jungle nearest the mainland, and indulge in a discussion with him. The mainland is infested with tigers, and they occasionally swim over the channel in search of prey, which is plentiful, as the island is well peopled. The number of natives and Chinese annually eaten by tigers varies from year to year, but it is always unhappily large, and there seems no way of reducing it. The tigers only attack persons on foot, and for that and other reasons (not unconnected with heat and heaviness) I shall make no pedestrian excursions to distant points. The Federal Reserve Bank's estimated consumer price index shows that $1 in 1878 was about $21 in 2007 dollars; a $60 steamship fare then would be about $1260 now. SINGAPORE'S English-speaking inhabitants know it best as "The City of Smells." If there is one predominant smell in Singapore today, it is not the withering blast of the garlic the natives put in their food, or the sickly sweet smell of the Zam-Zam hair oil they put on their heads; the strongest and biggest smell in Singapore is the sulphurous stench of unprocessed rubber. To the people of Singapore all the perfumes of Araby could not smell as sweet. Rubber has skyrocketed Singapore's prosperity. A record 703,891 long tons were produced last year, another 448,989 long tons imported from Indonesia, Siam and Indo-China for processing in Singapore plants. At the beginning of 1950, rubber was selling for a little over 17¢ a pound. Then the price began to rise furiously, hit a high around 80¢ a pound. The buyers: U.S.A. (35% of Malayan production), Britain, Europe, Red China (up 600% from 1949), the Soviet Union and European satellites (up 28% from 1949). Whenever the price takes a nip-up, there is a wild scramble in the offices of Lewis & Peat, the world's largest rubber brokers, whose daily turnover frequently reaches $90 million. In the Hong Kong & Shanghai Bank's new million-dollar, air-conditioned office, an hour's business will see clerks and tellers chest-deep in bank notes. Depreciation of the Pith Helmet. The rubber boom and less spectacular booms in tin and pepper have bounced salaries and wages all along the line. The rich are spending their money on bigger and flashier cars (a Rolls-Royce is no rarity in Singapore), larger and more elegant homes, wild and lavish partying. They win & lose tens of thousands of dollars at mah-jongg and soo-sek (a game like rummy). Aw Boon Haw, the fabulous "Tiger Balm King," has added a nightmarish swimming pool to his huge Singapore residence; on the bottom of the pool are outsize hand-painted statues of mermaids, Oriental-style. The 16-story Cathay building, Singapore's only skyscraper, is aglow nightly with a Broadway-style electrically-lighted advertisement of Esther Williams in The Duchess of Idaho. Less ornate cinemas run serial thrillers... The dance halls, puppet shows, Balinese dancing-girl acts, shell games and other enticements of the "Great World" and the "Happy World" amusement parks are breaking all previouos attendance records; consumption of liquor is at an all-time high. Shops and bazaars are jammed with Chinese women in high-collared silk dresses, Malay women in brightly colored sarongs, Indian women in saris. They spend money freely, balking only occasionally at the steadily soaring prices. Inflation keeps pace with prosperity: already a can of Canadian salmon, a relatively expensive dish to begin with, is appreciably cheaper than fish caught along Singapore's own waterfront. Chinese amahs who never before had permanents have them now. Pedicab drivers who used to be barefoot are sporting new, all-leather sandals. The pith helmet is no longer the hallmark of the pukka imperialist: the helmets, many of them carefully coated with aluminum, gilt or yellow paint, sit grandly atop the heads of coolies. These days an Englishman would rather walk into the lobby of the Raffles Hotel without trousers than be caught wearing a pith helmet. Combating the Communists there are now 110,000 police and 25,000 soldiers, including nine battalions of British, eight of Gurkhas, and four (soon to be six) of Malays. They are supported by some R.A.F. planes and Royal Navy ships. Despite all efforts, however, the number of Communists does not seem to diminish, but stays consistently between three and five thousand.